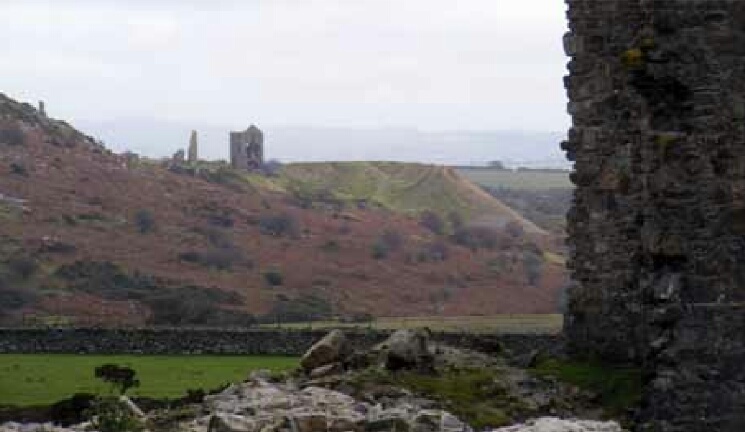 When Peter Clymo and his fellow adventurers struck copper at the South Caradon mine in 1837, they began a mining bonanza in the area, which made fortunes for some and utterly changed the local landscape. Yet in little more than half a century mining on any major scale had ceased completely, never to resume. A Cornish mining landscape captured. The Cornish mining industry was one notorious for fluidity driven by the twin vagaries of ore price fluctuations and the unpredictability of the richness lying beneath the surface. Mines opened and closed frequently, their boundaries moved, and names often changed. Any attempt to understand the rich industrial heritage of Cornwall has to contend with the problem of interpreting this ever changing landscape. This book by William Locock Webb and Edward Geach is one of the few contemporary publications written that enable us in the 21st century to obtain a snapshot in time of this changing landscape. The original audience for the book was the investors and dealers in the London share market. It was written to inform share holders about the distant properties that they would gamble their money on. Within its pages they could find descriptions of the mines, tables of financial information, and selected reports from the mine agents. All this would have been useful as a reference to anyone scouring the weekly Mining Journal in the hunt for potential investments. It was priced at 1s 6d and published by Williams and Strachan or Effingham Wilson at Royal Exchange. Effingham Wilson became famous as a radical publisher but he also printed books for the pioneering London Statistical Society so perhaps this book’s analysis of the finances of the mining market appealed to him. Webb and Geach were share brokers who specialised in selling mining shares. They were in partnership together, forming one of the many companies that had developed by the 1860s to serve the expanding Victorian finance industry surrounding Cornish mining. The partnership was later expanded to include John George Pennington but was dissolved on the 13th April 1865. It became common practice for these share broking companies to issue “expert” advice and become commentators within the mining press on the industry. This book was printed as part of that advice, a service to their potential customers. 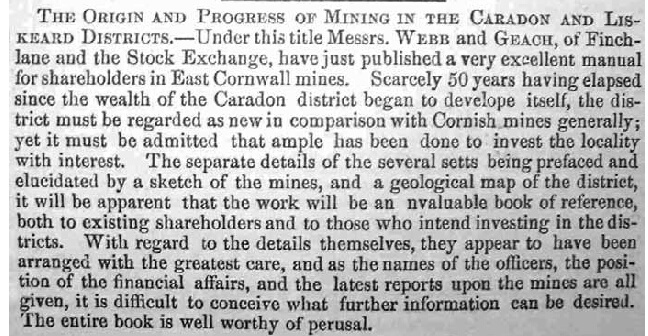 Another publication by published by the partners was A brief Review of the British and Foreign Mining Markets for 1861, with prices, dividends, ore sales, etc. which was printed in 1862. Webb and Geach also wrote articles for the mining and smelting magazine reporting of share price movements in the mining industry. They worked from offices at 8 Finch Lane, London and the Stock Exchange, very much in the centre of the City. Finch Lane lay between Threadneedle Street and Cornhill, only yards away from the Bank of England. The scene outside their office door was very different from that of the open moorland of Bodmin Moor on which many of the mines described were located. 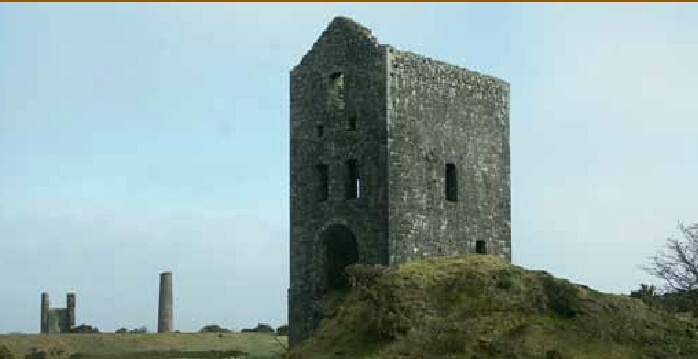 Power here derived not in the huge Cornish Beam engines of the mines, but in the money of the rich capitalists. It was not the skill of the miner that was important here, it was the shrewdness and luck of the investors. By coincidence James Watt the engineer served an apprenticeship as an instrument maker in Finch Lane, learning some of the skills that one day would make a massive impact on Cornish mining. The 2011 Edition, published by the Trevithick Society. This reprint has been transcribed from a typewritten transcription held by Liskeard Library; the reason for the original manuscript is not known but the fragile state of the pages would indicate it was made many years ago. It was the fragile state of this transcript that was the prompt for this new transcription, to allow future generations to read this remarkable description of this remarkable mining district. New material added includes the sett map, contents list, editor’s notes, glossary and index. This additional material has been reproduced in a modern typeface to differentiate from the original text. The only changes to the Webb and Geach text have been the introduction of some additional paragraphing to improve readability. Reference has been made throughout this reprint to the Brenton Symons map of 1865. 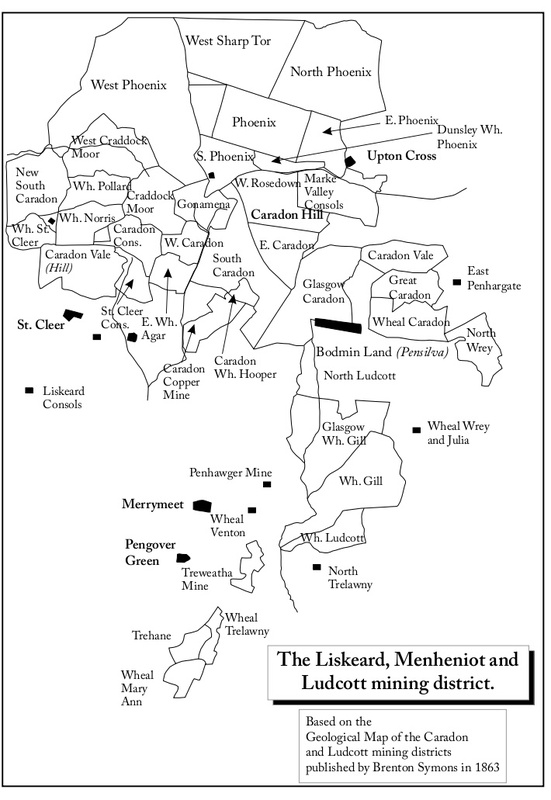 A Kindle version of this map is available as ‘The Liskeard Mining area in 1863, a publication that gives the reader the valuable opportunity of comparing the text of this book with a geological map produced in the same year. If you in the Liskeard Area then pop along to the Bookshop on the Parade for a copy.